Use kid-friendly products – Kids love to see their favorite characters on the products they use, and dental care products are no exception. If you find a toothbrush, toothpaste and floss that are kid-friendly, your child might actually be excited to use them! Be an example – Young children look up to their parents, and they will follow the example that you give them. Let them watch you brush and floss every day! It is also a good idea to brush your teeth as they are brushing their teeth! Get into the habit early on – It can take a while to get into a new habit. It is so much easier to start caring for your child’s teeth when they are babies. If your child has had their teeth brushed all of their life, they will be much more receptive to it! 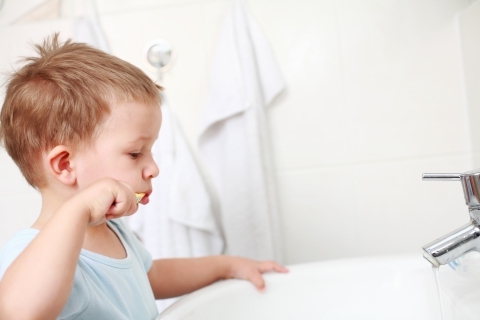 Learn about more ways to encourage your kids to brush their teeth by staying tuned for our next blog.